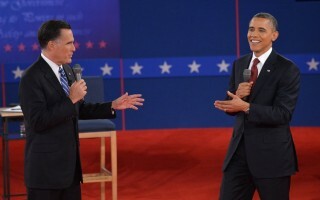 Well last night millions of people worldwide watched the duell between Obama and Romney on TV. Lots of opinions and comments being written within the last few hours. Obama looks more confident than Romney. Instead of looking at Romney, which one could think it would be necessary in such a situation, he looks at the audience or the moderator. He is not abandoned on Romney. His left hand point to Romney but still stays near to himself. Obama does not need to point to Romney too aggresively, as Romney does. Obama smiles gently and knowing. Whereas Romney coweres a little and tries to point at Obama with his right hand. It seeems to be more shy and timit and hesitating. But this gesture is not convincing. He looks at Obama but cannot get into contact with him and his eyes. Though he intended to be aggressive, to attack Obama again as he did the last time, all this is gone. It seems to be a fight where the one needs the other to be there. He is not existing without the other. Whereas the other, and this is Obama, is there, connected to all the people and the setting, and does not the other to be there. Being aware of the habit often leads to some genral impression. You cannot avoid it, even if you try. If you get such an impression by a represantive photo, you will get some interesting impression which can be some kind of an inner guide to find your opinion.